A couple of weeks ago, a neighbor shared a bottle of hard-to-find-in-Massachusetts Petite Sirah that he received via their mailing list. I had a look at their website and submitted a request to join their wine club. A few days later, they contacted me to let me know that it would be difficult to ship to MA. One shipper they work with was very expensive- $60 for 2 bottles (the wine only costs about $40 per bottle!). The other shipper said they could only ship if it went through a distributor. Both of these options sounded unattractive, especially for a wine club scenario where I'd repeatedly receive shipments from the winery throughout the year. Everyone always says that I should just receive shipments like these via friends and relatives in a neighboring state. I guess I could, but what a pain in the neck that would be for everyone involved. At minimum I'd be burdening someone to accept deliveries for me. What if they weren't home for a few days when the deliveries came? What if it was too hot or too cold and the wine sat outside for a few days? And then we have to arrange pick-up somehow. That could be a nuisance as well. What bothers me most about this situation is that this winery should be able to legally ship wine to MA already. Since they produce less than 30,000 gallons a year, they could acquire a permit to ship to MA by submitting an application to the Massachusetts ABCC. Here is the form they'd need to fill out. The fee is $100. The winery would need to file quarterly reports on how much wine they ship to the state and collect MA state taxes for the shipments. Although this may seem like a pain in the neck and expensive for small wineries to navigate (and it is), Massachusetts isn't the only state in the country with permit requirements like this. It's actually the model legislation that Free The Grapes.org endorses as equitable for the interests of the winery, the consumer and the states. Let's say this winery decided to go through the effort of applying for one of these permits and they were granted a license to ship to Massachusetts. Where would this get them? Well, they'd find out quickly that they weren't able to ship to Massachusetts because, strangely, UPS and FedEx don't ship wine here! "UPS does not accept shipments containing wine to or from Massachusetts." Um, OK. Strange that they'd put that front and center on their site. And strange that Massachusetts would be selling permits to small wineries to ship wine to the state when UPS doesn't actually ship here. How about FedEx? Can they ship to Massachusetts? If we consult FedEx's from-to wine shipping tables we see they cannot ship wine from CA (nor other states) to MA. What's the deal? Well, there's this wacky law which requires every one of a shipper's trucks need to be licensed in order to transport wine around the state. My understanding is that FedEx *has* gone through the hassle, and paid $150 for each truck they use to deliver wine. So I'm at a loss as to why they don't ship wine into Massachusetts. It could very well be related to this outstanding litigation regarding whether *large* wineries should also be able to ship to the state. This legislation is a farce, it would seem, since small wineries should already be able to ship and in practice they cannot. A colossal waste of time if you ask me. There's got to be a better way. MA House No. 317. Check progress here. MA Senate No. 176. Check progress here. In doing research for this piece, I contacted the offices of the legislators who are sponsoring these bills. They provided me some clarification related to the intent of the bills, but overall I was left with little confidence these bills are being moved through the system with any urgency. That's where we each come in as citizens of this state. The best way I'm aware of to move these issues along is to contact our respective representatives and let them know that this is important to us. Don't know who your representative is? I didn't. A list can be found here. Give them a call. Tell them you support direct wine shipment and ask them what they're doing to help move this along. If they don't support the proposed legislation, maybe we shouldn't support their re-election. Keep in mind this legislation only applies to *wineries* shipping to Massachusetts. Out of state retailers (like Wine Library for example) would still not be able to ship to the state. Consider signing up for E-mail updates from The Wellesley Wine Press for updates on these and other Massachusetts wine shipping laws. There are some nuances associated with the proposed legislation I'll be discussing in upcoming weeks. On Sunday August 30th, 2009 from 1-5PM Bin Ends Wine in Braintree, MA is having an end of summer blowout Wine Flea Market. Stop by and sample more than 60 wines on sale at 25-50% off retail and then place your order for later pick-up. The event is free. Here's a nice event for your consideration. 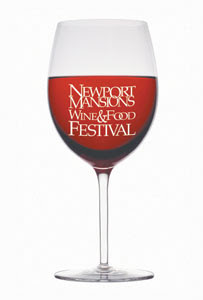 The Preservation Society of Newport County presents the 4th Annual Newport Mansions Food & Wine Festival the weekend of September 25th-27th, 2009. There are a number of options available for attending the event, but I think the most popular will be attending the Grand Tastings that occur both Saturday and Sunday afternoon. 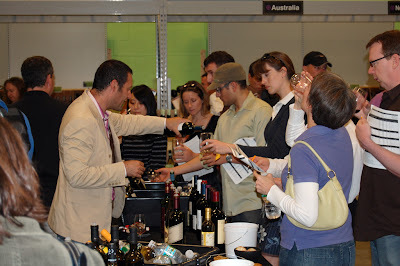 Tickets are a little bit more affordable for the Sunday tasting ($75), and if you purchase tickets by September 14th. To attend the Grand Tastings, free parking is available at nearby Easton Beach on Memorial Boulevard. Free shuttles will transport you to Marble House where you'll enter through the mansion and then enjoy the tasting in a large tented area overlooking the Ocean. Attendance is limited to about 1,500 people for each of the Grand Tastings so expect this to be quite a bit more intimate than an event like the Boston Wine Expo. I'm planning on attending the event, so I hope to see you there! Click here for tickets and more information. Wine Spectator is cranking up the hype machine for the 2007 vintage of California Pinot Noir, calling it the "best ever". I've had a chance to look through the magazine and sift through the ratings listed in their online database. To date, they've rated 384 California Pinot Noirs and there are some choice values to be had. My impression of the vintage, based almost entirely on their ratings at this point, is that it presents an opportunity to purchase some really highly rated wines in a popular category without breaking the bank. This isn't necessarily a vintage that's produced a long list of 90 points wines for $20. Don't we wish! Rather, it's a vintage that rewards value hunters for their research and those willing to spend just a little more than the median per-bottle price of $45. Taking a look at the graph above showing rating vs. price, I've highlighted in red the value circle of the chart. These are the highly rated wines that cost the least. I put all of these wines through the wwpQPR (what's that?) to see where the values were. I used a wwpQPR baseline price for this vintage of $30. 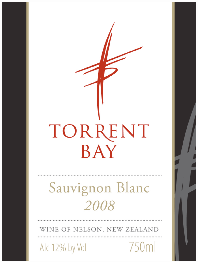 This is the price at which is it relatively easy to find an outstanding bottle. Although there are only 8 wines for $30 or less that received 90 points or more in this study, if you include Oregon Pinot Noirs (which many people consider superior if stylistically different than California) and look across other still-available vintages I think it wouldn't be too hard to find an outstanding bottle for $30. Unfortunately, availability of these wines is quite poor. I tracked down a couple of bottles of the Red Car but it required a fair amount of research and persistence. Here's an interview I did with Paul Sequeira from Red Car after they heard about this big rating from Spectator. Availability is quite a bit better on these wines. I have not seen the Joseph Swan yet, but both the Paraiso -and- the Roessler are available as of this writing at VinoDivino in Newton, MA. 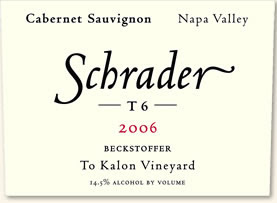 Overall, if we compare this vintage to another popular category like 2005 Napa Cabernet Sauvignon, what we see is that neither are particularly affordable. However, Pinot Noir doesn't get as expensive at the high end as Cabernet does. There was only 1 bottle of Pinot Noir rated that cost more than $100. 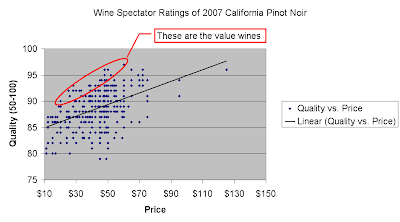 Of the 2005 Napa Cabs rated by Spectator 25% of the wines cost more than $100. My point? 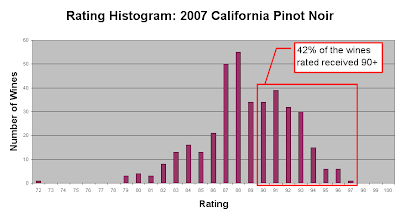 If you like Napa Cab and California Pinot Noir, and want to splurge on a really highly rated bottle, you'd probably find better options in 2007 Pinot Noir. This 2008 California Pinot Noir is ahead of the curve. It's already been released, rated 88 points and is only $8. A tasting of the 2007 Paraiso Pinot Noir reveals mixed results. If you're a retailer and carry any of these wines, please contact me- I'd be happy to add your availability to this piece. Question of the Day: Which 2007 California Pinot Noirs are you buying? The comments have been analyzed and we have a winner. 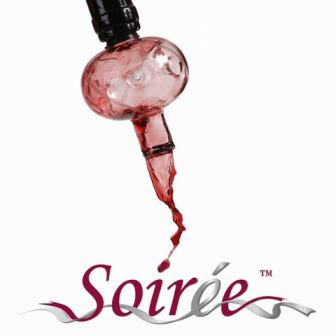 In our "leave a comment for a chance to win a free Soirée In-Bottle Wine Decanter" contest we received a number of excellent comments, and although we can pick only one winner, everyone who left a comment gets a prize. Last week, we wrapped up a giveaway related to "Wine Aerobics: Why You Should Aerate Your Wine". Andrew Lazorchak from Soirée walked us through a number of simple fundamentals which can help us all enjoy the wine we drink more, and paid particularly close attention to the subject of aeration. The comments were fantastic, and we truly appreciate everyone who read the piece and especially those who left a comment. Marc raised a question about "breathable" glasses and Andrew offered up his impressions and suggestions in this class of products. Heath Stone, whose comments way back on my very first wine aerator review made me aware of the existence of the Soirée, shared a useful tip: If you don't have an aerator handy "shake" the bottle of wine to give it some air. Fans of Molly Dooker wines in particular are fond of shaking them- the winery even recommends it. Just a day before the contest ended, Mark swooped in with an amazing comment that captures the relationship between wine and air beautifully. Andrew confided that the last paragraph in particular nearly brought a tear to his eye. It was hard *not* to award the prize to Mark. However, it was decided that the prize should go to the very first comment which was from @s1simps. She shared that she is new to wine drinking, preferring mostly sweeter white wines at this point, and appreciated the guidance on letting wines breathe. For the pro-active nature of her comment (being new to wine and seeking out information in wine blogs about aeration) Soirée will be happy to ship her one of their in-bottle wine decanters. Congratulations to @s1simps, and to everyone who left a comment because Andrew would like to extend a $10 coupon for the Soirée online store to anyone who left a comment on the piece to thank you for your enthusiasm and participation. My thanks again to Andrew for his generosity, and for sharing his thoughts on wine enjoyment with us. You can follow Andrew at VineyardVlog.com and at @WineSoiree on Twitter. If you left a comment and would like to take advantage of the $10 coupon code offer, please E-mail me at wellesleywinepress@gmail.com and I'll let you know what the code is. Thanks again.